Hedgehogs provide maximum reward for minimal effort when it comes to care. 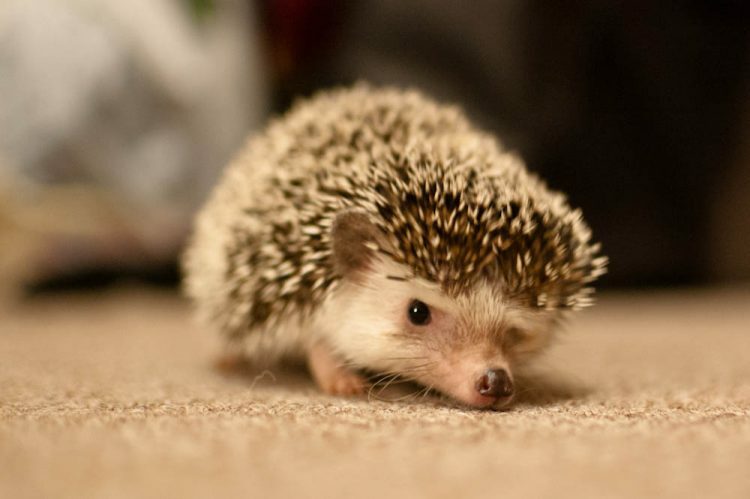 When people think of hedgehogs, the first thing that comes to mind is spiny little creatures with sharp quills. The hedgehog is often confused with the porcupine, whose quills can cause severe harm, unlike the hedgehog’s quills, which are relatively soft. So you know what that means, right? A hedgehog can be a pet! Hedgehogs are commonly playful, cuddly and adaptive to anyone’s lifestyle and schedule. Hedgehogs’ average life span is 4–6 years (but some have lived to be 9). They enjoy warm temperatures (think 65–80 degrees Fahrenheit), but they avoid direct sunlight. The hedgehog was used before the groundhog to forecast the timing of spring. 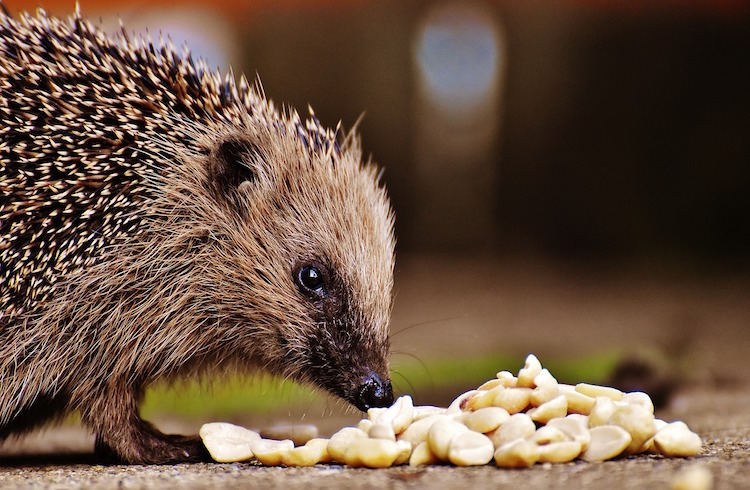 Consuming hedgehogs for food, medicinal purposes and rituals still occurs in some countries. Baby hedgehogs sleep a lot. Cute, photogenic and trending on just about every social media site, hedgehogs seem like the perfect prickly pet. However, what you don’t see online is the amount of work, time, effort and research that goes into keeping a hedgehog. They’re arguably harder to care for than other small mammals, so you may want to think twice before adopting. Because these are niche pets and not sold in major pet stores, information and general knowledge on keeping hedgehogs are limited. Do your research to confirm that an exotic veterinarian practices in your area. To be safe, call potential vets to make sure they treat hedgehogs. In addition, consider the economic burden that comes with visiting a vet, and keep money aside for emergencies. There’s nothing scarier than lacking the resources needed to take care of your hedgehog’s medical emergency. Hedgehogs do not need vaccinations, but it’s a good idea to visit a vet as soon as you adopt one. To prevent the medical conditions just mentioned, bring your hedgehog in for a yearly checkup. To be safe, also check your town ordinances to ensure hedgehogs are legal in your town or city. A major aspect of keeping a hedgehog includes bonding, and trust me, this can be the hardest part. It could take weeks, months and possibly even a year before your hedgehog warms up to you. 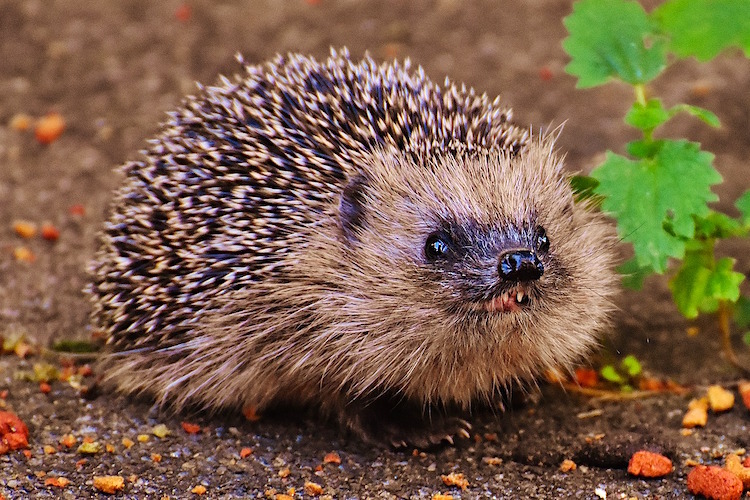 During this time, a hedgehog will puff (also known as huffing) and hiss constantly. As a human, it’s best to show affection despite the hedgehog’s reaction. Yes, on YouTube and Instagram, hedgehogs look like the cuddliest little creatures. In reality, though, they’re not born to cuddle, and developing a relationship with yours will probably take a lot of patience. At the bare minimum, a hedgehog’s cage should be 18 by 24 inches; however, the larger it is, the better. If you live in a small apartment, dorm room or just don’t a lot of space in your house for a cage this large, you may want to rethink adopting a hedgehog. A prospective hedgehog caregiver should gain experience keeping a small mammal before adopting a hedgehog. Fresh water, food twice a day and constant cleaning of their living space is required. Hedgehogs can be a bit daunting at first because of their hissing and puffing, so they aren’t for the faint of heart. Yes, the quills will poke you many times, but no, the quills don’t hurt. Use a plush towel to pick them up until the animal gets used to you and doesn’t puff as much. Don’t get us wrong — with the right care, a hedgehog will become your best friend and can make a terrific pet. However, this is not an overnight process, and the effort may not be worth the reward for some people. Nonetheless, these prickly little friends make a unique companion you’ll remember for a lifetime. If you have the time, space, knowledge and dedication to care for one, I highly recommend adopting. Hedgehogs are solitary creatures and prefer to be caged alone. When left to roam free, hedgehogs present other considerations for existing pets. Cats seem to take to hedgehogs quite well; once their paws meet the quills on the hedgehog’s back, they are more likely not to attack or show aggression. Small dog breeds may acclimate to hedgehogs, while large breeds are not suitable. As with any new addition, supervise all interactions with your pets until you are confident that they can play together safely. The ideal housing for a hedgehog should provide at least 4 square feet of ground area, have a solid bottom (no wired or fenced cage bottoms), a closed-footpath wheel for exercise and child-safe toys. Empty toilet tissue rolls can be given to hedgehogs older than 3 months. Use wood shavings for bedding up to 2 inches thick inside the cage, but don’t use cedar chips, which are toxic to hedgehogs. If using a litter box, fill it with a non-clumping cat litter. Hedgehogs also like to play with their water and dunk things in their water bowl, so it’s best to use a vertical water bottle. A heavy food bowl is also recommended to avoid having the hedgehog dump out its contents. Hedgehogs can have dry and itchy skin. Bathe them a few times per month with unscented body wash in a sink or bathtub, but make sure the water doesn’t rise above the hedgehog’s legs. Although hedgehogs eat insects mainly, they can eat other foods to maintain a healthy diet. Dry cat food, ferret or hedgehog food, cooked poultry and eggs, fruits and vegetables are also recommended, with dry cat food being a staple. Hedgehogs are mildly lactose intolerant, so avoid dairy products. Also note that dry food can wear down hedgehogs’ teeth over time; alternating wet and dry foods can help. Keep male and female hedgehogs separate unless breeding them. Males and females are ready for breeding at different times; check the timing of their mating schedules before breeding. Housing hedgehogs together or having too many in close proximity can cause loss of eyes from quill pokes. Cancers and lesions are possible; hedgehogs’ risk is comparable with that of other species. 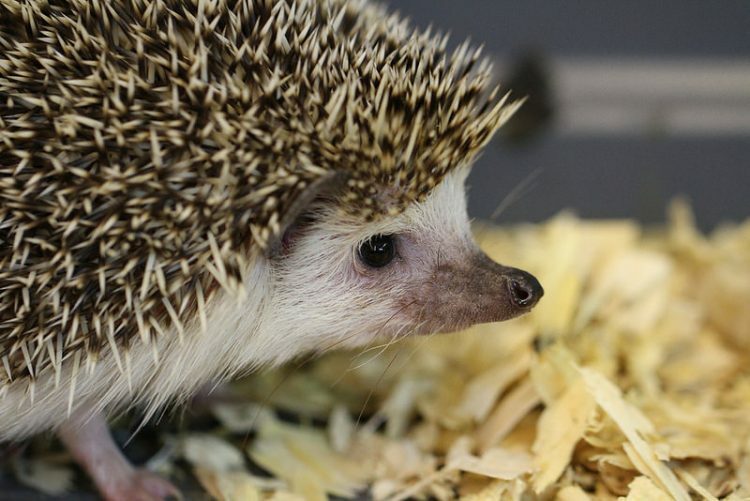 Wobbly hedgehog syndrome, or WHS, is a genetic disorder that eventually paralyzes the hedgehog. This disorder is difficult to detect and eliminate, and there is no known cure. Hedgehogs froth at the mouth and lean their head upward so saliva coats their quills. There is no known reason for this behavior. Before getting your new friend, check your local wildlife laws. 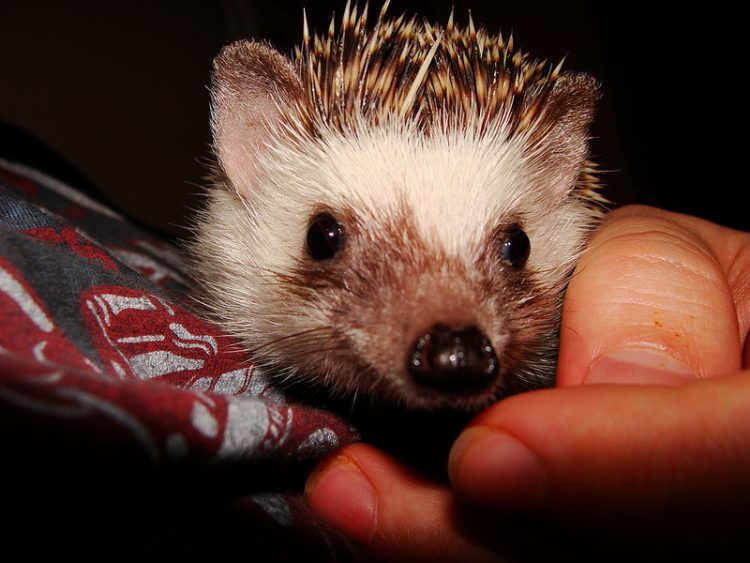 Several U.S. states and some countries have restrictions or complete bans on hedgehogs as pets. Ask for a guarantee regarding genetic defects when you’re adopting or purchasing, and inquire about any known WHS issues that have occurred. 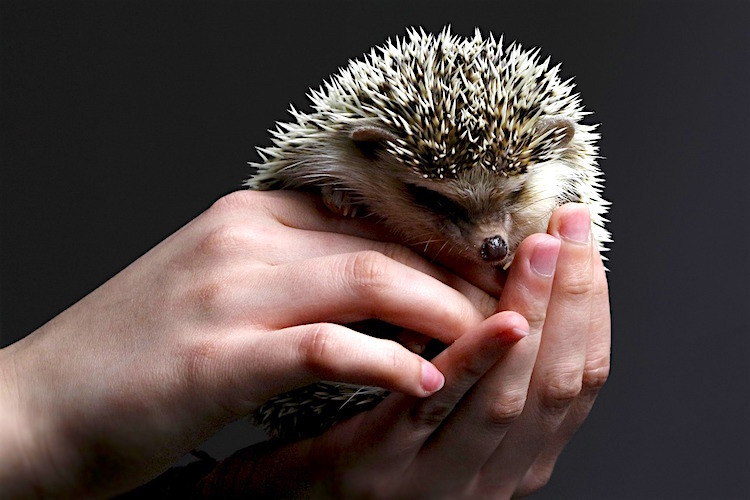 Temperament is also something to consider; choose a hedgehog who unrolls without too much delay, doesn’t make a “clicking” sound (a threatening signal) and doesn’t appear aggressive. Hedgehogs may hiss, but that’s normal. Confirm with the breeder that the hedgehog is over 6 weeks old. Review the face and head for any injuries, discharges or visible afflictions around the eyes, nose and ears. Check the hedgehog’s back for missing quill patches and the cage for green droppings; these are all signs of an unhealthy animal. Allow your new pet a full day in her new environment without distractions to get acclimated. It may take about a week for her to get comfortable with you. But be patient, and she will warm up to you (and your existing pets) in no time. Although hedgehogs should not be left free to roam the house unsupervised (especially if you have other pets), you can teach your hedgehog how to use a litter box, making cleanup a lot easier on you. You can certainly give litter box training a try — at best, you’ll have a much neater and easier way to clean up, and even if your hedghog doesn’t take to litter box training, you’ve at least bonded with them. Hedgehogs have wildly different personalities. You may have one who takes to litter box training like a duck to water, but also another who will flat out refuse to use the litter box. Size: Make sure it will fit in the hedgehog’s enclosure. Sides: There should be at least 1 very low side so your hedgehog can easily get in and out. Ease of cleaning: Heavy-duty plastic is durable and easy to clean. The idea is to make it as easy as possible for your hedgehog to get in and do his business. Too much of a challenge, and he may opt out. Regular cat litter can pose a problem for hedgies. “Kitty litter is not recommended as it can get stuck in penile sheaths and eyes,” warns the International Hedgehog Association (IHA). Clumping litters can clump up and get stuck to your hedgehog’s quills. Instead, you can purchase a type of small pet “bedding” that is available at many retailers. Alternatively, you can use torn-up paper towel that you have rolled up into pellets. At the end of the day, if you choose to use cat litter, check with your vet to be sure it’s OK for your hedgehog. Now that you have the litter box filled with the right litter and have placed it in your hedgie’s favorite toileting corner, it’s time to teach him how to, well, go. First? Take some of your hedgehog’s feces and place it in the litter box. The goal is to get him to smell it and make the connection that this is where he is supposed to do his business. Ideally, the next time he goes to eliminate, he’ll go to his corner – where his litter box is – and smell his previous leavings. Then he will make a new deposit (we hope). To help him, make note of his elimination schedule. Then, when it gets close to his normal elimination time, watch him closely. When he looks like he’s getting ready to go, gently deposit him into the box. If there’s one thing about litter training that all experts and hedgie people agree on, it’s that some hedgehogs just won’t use the box, and others may use it only sporadically. It may take your hedgehog a while to adjust to using the litter box, so stick with it — even if he hasn’t quite gotten it yet after a week or 2. Some hedgehogs litter train quickly and use the box the rest of their lives. What is more likely, however, is that you will have a hedgie who uses the box fairly often but still has some misses, particularly when he’s playing on his wheel. And other hedgies? They’ll just flat out refuse to learn at all. But it’s OK – they’re so cute, who minds scooping a little poop? Check out these hedgehog-loving websites for more information: Hedgehog Club, Hedgehog World and Hedgehog Central. But above all, have fun with your new furry friend! 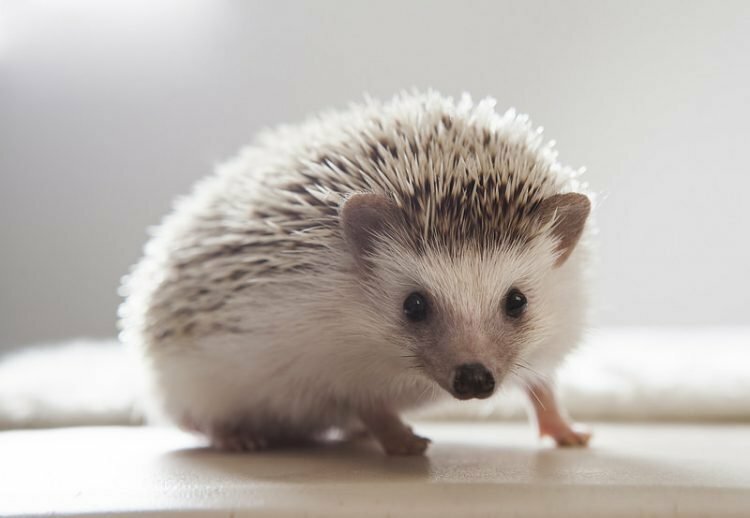 Kyle Moschen, who has a pet hedgehog, contributed to this article on how to care for a pet hedgehog. Other writers included Petful editor in chief Kristine Lacoste and Melissa Smith. This article was last updated Dec. 14, 2018.